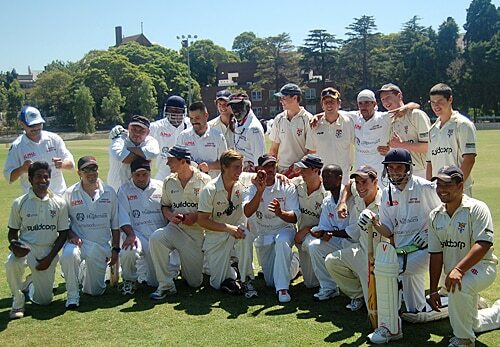 Unlikely friends: the University of Sydney and Compton Cricket Clubs. There was a different spin on the ball when Sydney University Cricket Club hosted a friendly twenty20 match against celebrity touring team, Compton Cricket Club. The Compton Cricket Club, a team of young men from central Los Angeles, visited the campus as the first stop on their two-week exhibition cricket tour of Australia. The brainchild of homelessness activist Ted Hayes, the cricket team emerged 15 years ago as a way to get L.A.'s youth off the streets. Its founder Hayes said the club has used the values of sportsmanship and focused on the importance of etiquette and fair play in cricket to help players develop respect for authority, a sense of self-esteem and self-discipline. There was plenty of self-discipline as the teams batted out the twenty20 match in sweltering heat. The home side won out reaching the target of 128 with a couple of overs to play. Umpire on the day, Geoff De Mesquita, Cricket Operations Manager at the University of Sydney, said that the visitors demonstrated great enthusiasm, particularly in the field. "They chased every ball hard and took some good catches, supporting each other with good mateship. With Hayes leading the rap comments on the field, it was a whole lot of fun, despite the mid-thirties temperatures." The teams joined each other at the end of the match for lunch to complete an enjoyable day, with the importance of this match and other matches on the tour, not necessarily the result of the matches, but the fact that this group of guys who were brought together from great adversity, being able to demonstrate those values referred to above and at the same time promoting cricket. "It's not often you get an opportunity to host this type of event, given the background of the touring team. However it turned out to be a great day, with our team playing the match in the right spirit and I can assure you proving great ambassadors for the University of Sydney. We were pleased to be part of this initiative and also to be able to promote the game of cricket in this way and to promote the University." Also referred to as the 'Homies and the Popz', the Compton team has acquired an international following not just for their skills with the bat, but also for their musical prowess. Last year the team released the world's first hip-hop cricket rap music video and were invited to demonstrate their musical skills at the World Bar at Kings Cross on Tuesday evening.